With New York City bracing itself for the mother of all snow-storms slowly making its way up the East coast, our fingers were crossed that we’d manage to make it to JFK before it struck. But before leaving we had one last person to see – in fact the only former political prisoner in NY who I had had previous contact with some time ago. Thankfully the timings have worked out well to allow us a visit to Metta Parami Monastery in Bedford Stuyvesant, Brooklyn and a meeting with U Pyinya Zawta, a founding member and the Executive Director in exile of the All Burma Monks’ Alliance (ABMA). The organisation was formed by a group of senior monks in response to the events of August 2007 when the military junta raised fuel and food prices overnight to astronomical levels. The leaders are recognised as the primary organisers and co-ordinators of the activities of the Saffron Revolution in September 2007 that ended in bloodshed as thousands were arrested with many more forced into hiding or fleeing to the border. One of the most famous leaders, U Gambira is currently serving a 63 year sentence in Kalay prison. However 3 other leaders, U Pyinya Zawta, U Gawsita and U Agga Nyana (below) escaped from Burma and were granted asylum in USA and are now living in the Brooklyn borough of Bedford Stuyvesant at the Metta Parami Monastery. U Gawsita, U Agga and U Pyinya Zawta. Leaders of Burma’s Saffron Revolution. We were welcomed to the monastery by U Pyinya Zawta who had just arrived back from an advocacy trip in Georgia – the 3 monks continue to play a crucial role on raising awareness and educating people about the situation in Burma and their trip to Los Angeles in 2010, despite Burma VJ not winning the Oscar, brought Burma’s plight right to the very heart of the world’s celebrity stage. The monastery, an ordinary building by appearance on a very normal Brooklyn street, is a hive of activity and is the headquarters of the ABMA. It was also a nice and unexpected opportunity to finally meet Aung Moe Win who is also living here at the monastery. Having met U Zawana and other monks on the Thai Burma border at various times over the past years it was a great opportunity to now be finally sitting with U Pyinya Zawta. U Pyinya Zawta entered a monastery at the age of 11. When he was 20 he was ordained as a monk and began attending Swedawsyin Pali University. Now an instructor of Buddhist literature, he moved to Rangoon Aloan Aung Mingala Pali University. In 1988 U Pyinya Zawta became President of Aloan Township Young Monks Union. In 1990 he completed his formal religious study. Having received a degree in Dharmasaria, he helped found the Zawtanarama teaching institute for the further study of Buddhism. That same year he was imprisoned in Insein Prison for his involvement with the first monks’ protest against the military, in 1988, that had usurped power from Daw Aung San Suu Kyi’s party after the military’s landslide election loss. Released from prison, in 1993, U Pyinya Zawta became an instructor at Zawtanarama Monastic Institute. He was rearrested again in 1996, but released after being interrogated. In 1998 he was sentenced to seven years in Insein. In 2005, U Pyinya Zawta moved to the Maggin Monastery and opened another study hall and an HIV/AIDS patient support center. In 2007 he helped form and led the All Burma Monks’ Alliance (www.allburmamonksalliance.org) to protest military rule in Burma. Tens of thousands of saffron-robed monks marched through the streets with thousands of civilians, chanting the Buddhist Metta Sutta invocation for loving kindness and peace in the world. As a result, Maggin Monastery was padlocked by the regime and the sitting Abbot was imprisoned. To evade arrest, U Pyinya Zawta fled Rangoon, resurfacing in Thailand in January, 2008. Granted refugee status, he resettled in the US in September, 2008. As Director in Exile of the All Burma Monks’ Alliance, U Pyinya Zawta has spoken extensively around the US, promoting awareness of the Burmese people’s struggle for democratic freedom. With the clock running down we paid our respects, said our thanks and had to head back into Manhatten to collect our bags and leave New York before the storm arrived… I think we’d have both been very happy if the storm came early but unfortunately it wasn’t to be and despite my efforts at stalling in the airport which resulted in a not unusual announcement over the tanoy for certain passengers to hurry up or risk missing their flight we kissed New York a fond farewell and finally USA has made its mark on this work. After Saturday’s full schedule and a day off yesterday to take in some sights and see friends, today is the day I have been waiting for. There was always another motive for making the trip to New York. Not really an ulterior motive, more an essential one, maybe just for me on a personal level I guess. Naturally, meeting the former political prisoners was the major issue in planning any trip, but before committing to coming to New York there was always one person I was waiting on. Today, after over a year of waiting, the day has finally come. I first wrote to a number of what you might call ‘A-list’ celebrities back in 2009 when this project first got off the ground. I was selective in who I approached both as people I would like to meet because of who they are and in what they do for Burma and Human Rights (George Clooney was one of them and although I never heard back from him it was a nice surprise to see the front cover of the book about his latest film “The American”directed by one of my hero’s Anton Corbijn… a beautiful portrait I’m sure you’ll agree). But it wasn’t until late October 2010, well over a year after my initial approach, that I suddenly received an email from Yoko Ono saying that she would like to be photographed by me for this project. I actually dropped my phone in shock when I read the email. I never once honestly expected anyone I had approached to ever to agree to be in this work, but personally, she was the one person I had really hoped who might just say yes. Of course there are many reasons why anyone would want to meet Yoko Ono. She is an artist, musician, author, leading peace activist and of course she is John Lennon’s wife. Who really wouldn’t want to sit down and have a cup of tea with her? The chance was simply too good to miss, she was someone who I would die to meet, so we dropped everything when she emailed me last wednesday and here we are now. We headed down to Greenwich Village, with time for a relaxing coffee in this beautiful part of town before making our way to her gallery where we had arranged to meet. I have to say now that this is not the sort of work I am accustomed to at all – being far more comfortable working in the background out of sight and mind or clandestinely in Burma as is often the case. But despite this I think we managed ok and got a half decent shot, but the photo was really just the icing on the cake – the cake itself was of course just meeting Yoko Ono and talking with her. She is amazing, a wonderful, kind person and I never really doubted she would be. As soon as she walked in to the studio, we were greeted with a broad smile and as soon as she saw Jackie (on seeing she was Burmese) she went straight up to her and threw her arms around her. If it had been appropriate for us to cry tears of joy I think it might have happened. I could never have imagined in my wildest dreams that she might have connected so much to what we are doing and to Burma in general. We chatted, smiled, laughed, took some photos and chatted some more… and more hugs all round of course. When the time came to leave we made our way outside and said our goodbyes, huge thanks to Karla and everyone for making this happen. But as she drove off into the distance we only then noticed that looking down on us all from high up above was John Lennon, himself. If meeting and photographing Yoko Ono achieves nothing more than providing me with an immense personal moment in my life, then so be it. But at the same time rest assured, she is totally and utterly impassioned with Daw Aung San Suu Kyi, Burma’s political prisoners and the people of Burma as a whole. Her heart and soul are very, very much with you all. We bid farewell to Myint Soe and head off for our fourth and final stop of the day a few blocks away in Queens to meet Ko Aung. By now it’s dark and snowing as well, so unfortunately no chance of another shot outside. Ko Aung greets us at his front door with a warm smile and welcomes us in to his home, but suddenly I am filled with feelings of deja vu. Not because of where we are but because there’s something extraordinarily familiar about Ko Aung and I’m left feeling we’ve met before somehow. Like almost every person we have visited in the past two years where their homes or places of work have walls adorned with pictures of Daw Aung San Suu Kyi and Burma’s long struggle for freedom, Ko Aung’s home is no different. Except upon closer inspection of many of the photos on the wall, the young man proudly standing at Daw Suu’s side in numerous different locations and times of Burma’s forlorn past is actually the very person standing right next to me. Ko Aung @ Aung Gyi Lwin was one of the many young students who became the ‘Tricolor’ students organization who provided security for Aung San Suu Kyi. Wherever she went they were at her side and they lived in her compound at 54 University Avenue with her. Ko Aung’s name was on the household list and his parents were only too happy that he lived with and looked after his ‘sister’. Ko Aung’s father had been a bodyguard for General Aung San so it was only natural that his son should follow in his footsteps. Their families were very close, whenever Aung San Suu Kyi or her family visited it was Ko Aung who would drive them around and it was he who collected Aung San Suu Kyi when she returned to Burma on the 3rd April 1988 to care for her dieing mother. It was Ko Aung’s father (with Aung Gyi) who broke the news to Daw Suu that her mother was ill. But there was something else familiar about him that was niggling away at me but I just couldn’t put my finger on it. We started looking through old photos from 1988/89, reminiscing and recognising so many of the people I have had the privilege to meet and come to know over the past years and then it hit me. As Ko Aung was naming the different people in each photo, more often than not the young man standing the other side of Daw Suu was Maw Lwin… Ko Aung’s younger brother also known as Maw Gyi who I had met and photographed in Japan! For me this is the beautiful part of this long journey. Whilst photos taken at face value can be used to raise awareness, to empower people or in campaigns, the real story and meaning to all of this lies in these people, brothers and sisters all over the world, together even though so very far apart. Tracing the footsteps of Burma’s political prisoners is an emotional journey at the best of times, but it’s little moments like this when links are discovered, entwining Burma’s bravest to one another that provide inspiration, if indeed any more inspiration is be needed. 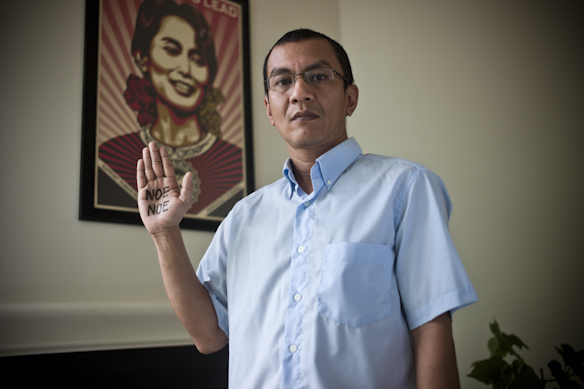 Burma’s political prisoners provide it in abundance. Whether it be the moment just now in linking two brothers a world apart, or photographing Myint Soe when he was in Mae Sot and now meeting him again at his new home in New York or even the act of writing the name of Cho Mar Htwe, imprisoned in Moulmein, on the palm of Khin Cho Myint and then six months later photographing Cho Mar Htwe herself. These are just some of the hidden stories these photos can tell. The next day, the 20th July 1989, at 7pm in the evening the military drove their trucks into the compound of 54 University Avenue and along with 48 others including Aung San Suu Kyi, Ko Aung was arrested and taken to Insein prison where he was detained under section 10(A). He was detained until April 1990 when along with six others he was released. The rest stayed in prison, some for a few months more, some for years. Upon his release he returned to University Avenue where he lived until Aung San Suu Kyi was herself released in July 1995. As the harrasment from the authorities commenced again he confided in Daw Suu that he could not face being sent back to prison again and decided he had to flee Burma. He was granted a US Visa and made his way to Bangkok, but trouble was waiting once again as he was pulled aside in immigration for questioning. He knew from the style of questioning that it was not the Thai authorities who were really asking the questions. He knew that behind the screen it was Burma’s Special Branch. After more than 4 hours of interrogation he refused to answer any more questions and a stand off ensued. Eventually he was allowed to go and he arrived in New York on 31st November 1997 where he has lived ever since. USA Day 1: The Orient Express to Myingyan. Burma’s Darkest Hell on Earth. Wrapping up from the shoot as well as the cold in Times Square we catch the subway over to Queens for our next installment of the day and a visit to meet Ko Nay Tin Myint and Ko Myint Soe. To some degree I felt riding the subways reminded me of being back in Burma. It’s been 20 years since I was last in New York and it seems like nothing has changed underground. As we step out in Queens it’s like being back in the real world as the fantasy fiction of Manhattan sits on the horizon a bit like Disneyland. I had hoped to be able to shoot everyone outside with New York landmarks in the background but the weather has put paid to that as New York is facing one of its worst spells in decades. With the light already fading fast we make our way through Ugly Betty’s neighbourhood (which brings a smile to our faces) to Myint Soe’s house. As we get nearer I suddenly realize we are walking underneath the overhead railway of the famous “Oriental Express” or the ‘7 line’ as it’s officially known. It’s classic New York and makes a great setting for a backdrop with all its meanings as well as looking straight out of a picture book of New York’s real life. So a quick call to Nay Tin Myint and he willingly comes to meet us and to brave the cold and do the shot outside just before the light calls it a day. Nay Tin Myint had been actively involved in leading student demonstrations during the uprising of 1988. Exactly one year on from that fateful day the 8th August 1988 he was arrested by officers from Special Branch SB14 as he gave a speech during an anniversary demonstration on the corner of Barr St in Rangoon. As he stepped down from the stage he was grabbed by 8 armed officers and ruthlessly arrested. A commotion ensued as people tried to help him but soldiers were quickly on the scene arriving with machine guns on the back of a huge truck. As he was thrown into the back of the truck one soldier stabbed him in the head with his bayonet – he still bears the horrific scar today. He was taken to a concentration camp, the HQ of SB14 and was brutally tortured for days. He told them he was an NLD youth leader as well as a member of the Tricolor student organization. He was swiftly sentenced by a military court to 3 years in prison and was sent to Insein. On leaving the court room he was asked by the so-called judge, General Aung Kyaw San, if he had anything to say. He responded that “I am doing this for the people. The people are on my side, not your side.” This didn’t settle well with the General. “Ok. You get 4 years” and he was hauled away with a further year added to his sentence. In jail he was tortured severely both physically and mentally, being kept in solitary confinement. He carried out a hunger strike and almost died but this didn’t stop him being shackled for almost 6 months until he was transferred to Tharawaddy. Again he performed another hunger strike over prison conditions and was the transferred to the darkest hell on earth that is Myingyan prison. Once again in Myingyan he was shackled until his release in October 1993. His right leg was paralysed due to more than a year of being shackled and severe torture. He needed 6 months in hospital in Rangoon and then a further 9 months before he was able to walk again. In spite of everything he had suffered he continued his political activities but was arrested once again in June 1993 with 11 comrades as they had met with UN Human Rights Commission representatives and had handed out the “New Era Journal” (a newspaper produced by exiled opposition groups). Nay Tin Myimt was sentenced to 20 years in prison and was sent back to Insein. One year later he was transferred once more to Myingyan where he would stay for 11 years until his release in July 2005. 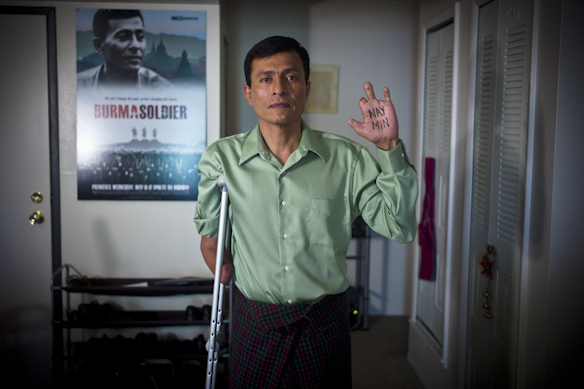 Torture and brutal treatment of political prisoners is state policy in all of Burma’s prisons. It is shocking, systematic and arbitrary. It is also illegal. Whilst the notorious Insein prison harbours some of the most brutal torture that has ever occurred on this planet, it is the darkest hell on earth that is Myingyan prison were suffering knows no bounds and has become the model for breaking spirits and the destruction of resolve. As the AAPP report ‘The Darkness We See’ states that upon arrival “…the first treatment given will be covering his eyes with a dirty piece of cloth. Beating immediately follows as a second lesson. The prison authorities refer to this event as the ‘welcoming ceremony with orchestra’ in which they regard truncheons and bamboo rods as musical instruments. Solitary is mandatory. Treatment where it is forbidden to speak or even look at anyone and when someone passes by your cell you must have your head bowed. The world has no eyes or ears to the abuse that goes on inside the walls of Myingyan for if it did then it would surely have acted by now to bring an end to this inconceivable mess. 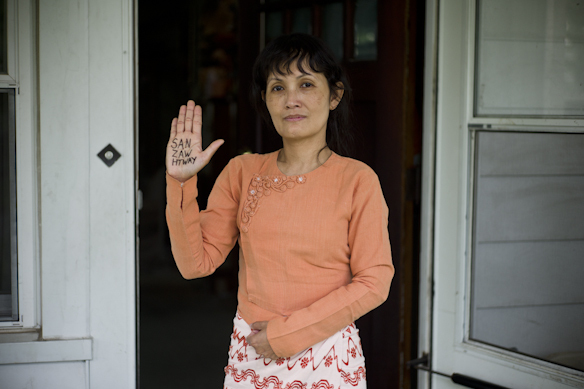 Nay Tin Myint spent 7 years in solitary confinement. For 7 whole years he saw no-one other than the weekly visit by the superintendent but even then he was not allowed to look or speak. The only time he could get out of his cell every day was for a few minutes to have a bath with 15 cups of water. He was never once allowed the statutory 30 minutes exercise. During an ICRC visit in 2000 he was called for by name to be checked due to the concern over the abuse he was being subjected to and the state of his health. During his time he was shackled on 2 separate occasions, the first time for 3 months but the second time was for over a year. He received no medical treatment at all. Despite this treatment he summoned up the strength from within to launch a counter offensive against the regime by carrying out yet another hunger strike, but this would be one that would have very different results that bring true meaning to the term ‘will to live’. In 2005 he started a hunger strike that would last 14 days. For the first 8 days the authorities gave him water but after that they stopped. When the authorities tried to force him to eat and even offered him medical treatment he still refused. He was sure he would die but he was never going to give in. By now the prison authorities were so concerned they called the military’s Regional Commander, Ba Myint, who came straight to the prison. 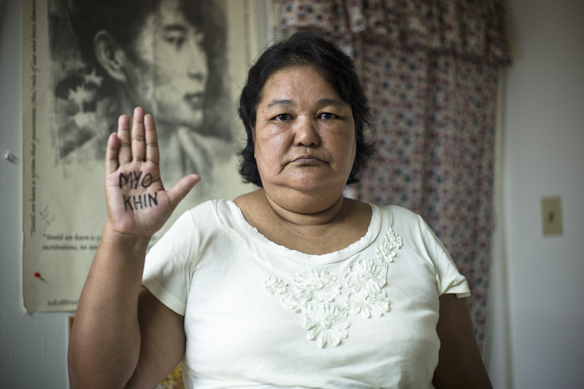 Nay Tin Myint’s demands for political prisoners were simple – the right to receive a reduced sentence; improved food and medical treatment enabling them the right to access to hospital outside the prison if needed and finally the right that political prisoners could write to their families. His stubbornness was to prove valiant as one by one his requests were granted as the authorities gave in to his demands. He was released soon after and returned to Rangoon. Having suffered such senseless brutality for 15 years, after undergoing some serious medical treatment, the first thing Nay Tin Myint did was to return to his former political activities where he rejoined with all his former student colleagues, Min Ko Naing, Htay Kwe, Ko Ko Gyi and others and history was made as the 88 Generation Students organization was born. He played a big role in many of their activities including the White Campaign but in May 2007 he was forced to flee Burma as the junta came for him once more. He fled to Mae Sot where he worked for the NLD-LA and in April 2008 he was granted special case referral to resettle in USA. He is now the Secretary 1 of the NLD-LA USA branch. After shooting underneath the Orient Express we headed to Myint Soe’s house so we could all talk over a nice cup of warm Burmese tea. 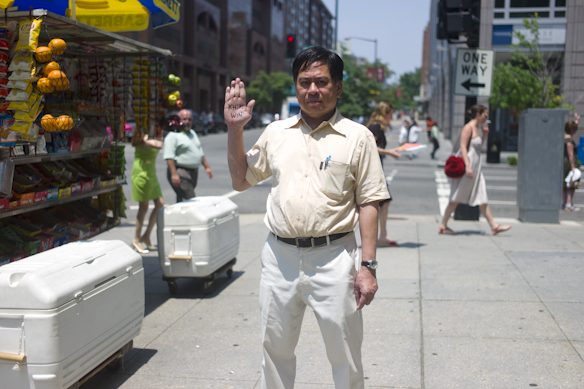 Myint Soe, a central committee member of the NLD-LA spent 16 years in prison in Burma. I had previously met and photographed him in Mae Sot back in July 2009 and now here we are on the other side of the world, in very different scenery as it starts to snow outside but a link to the past in many different ways. We all chat away for what seems like hours but with the night closing in we have one more person to meet and the surprise I could not have envisaged. Brief background… This was a trip that came from nowhere and was totally unexpected. Wednesday evening I get an email from a certain person (who you’ll hear about soon…) asking me to come to New York to meet on Monday. The opportunity simply can’t be missed so everything gets dropped and cue frantic phone calls and emails to various contacts in USA to try to arrange as many former political prisoners as possible in New York. 24 hours later we are on the plane. Before I go any further I’d like to thank everyone who helped pull this together and in particular the unbelievable efforts of Nickie Sekera, Tim Aye-Hardy and Ko Myint Hlaing. Touchdown USA at last. After our aborted efforts last year it’s very important that we are finally here. If this truely is the ‘…home of the brave’ then there are no people more brave than those whom I am going to meet on this trip. It’s freezing cold and yet again snow welcomes us as we embark on another leg of this mission. The sprawling gargantuan metropolis that is Manhattan awaits and there’s no time to lose as we are only here for a few days and of course there’s lots to see as well as to do! Customs at JFK was surprisingly quick and left me wondering what all the fuss was about – we had a harder time getting into Norway and Japan. The remainder of our day was spent wandering around taking in the sights and size of Manhattan as well as trying to come up with a few ideas for locations, but unfortunately the bitter cold would mean that shooting outdoors would be almost impossible. We touch base with our man on the ground Tim Aye-Hardy and it’s confirmed that tomorrow we will have 3 maybe 4 people to shoot. (This day will now be split into 3 seperate postings for each person – ed). Saturday morning and we head straight to Times Square as there’s no time to lose – not only is it minus 2 but it’s going to be a long day traversing across New York City. If only one shot was going to be done outside I decided that this had to be the one – standing in the middle of a scene epitomising western freedom with a gaudy shine that glosses over the darkness that lies underneath – a darkness that has been experienced to it’s fullest degree by Burma’s political prisoners. We scout for a few positions to try to get as much in the background as possible, the ever present model Jackie San standing on every corner and picture postcard spot of Times Square until we decide that the top of the red stairs of TKTS provides the perfect position aloft of all the madness that this world has to offer. The walk up what symbolises a red carpet is more than deserved by Ko Thet Mhu, and the first shot of the day is underway with both Jackie and Tim taking it in turn to film as the bitter cold makes it a real challenge to keep your hands out of your pockets let alone hold them aloft for Burma or try to take pictures. Thet Mhu played an active role in student demonstrations in the 1988 uprisings but as the army cracked down he fled to the Thai-Burma border with his colleague Moe Thee Zun. Whilst many students stayed on the border and formed the ABSDF to take up the armed struggle against the regime, Thet Mhu decided to return to Rangoon to continue the non-violent struggle and when he returned he played a role in the reforming of the Ba Ka Tha organisation of the ABFSU. He travelled to Mandalay to help build up the movement and spent time with a number of other activists in the Masoe Yain monastery – a secret refuge for student and other activists. He returned to Rangoon where he was now actively working for the ABSDF as well as Ba Ka Tha in an attempt to unite student organisations. On 22nd November 1990 he was due to meet a contact from the border at Rangoon Central Railway Station, but as he was waiting he was aware that Military Intelligence were on to him and were waiting. Upon meeting his contact they both fled from the station with MI in hot pursuit – Thet Mhu stopped to pick up his slipper which had fallen off his foot as he was running and he was pounced on by 3 MI officers. A fight then ensued in the middle of the street but he fought them off before fleeing again. However, both men were eventually caught and arrested and sentenced to 7 years in prison. He was just 19 years old at the time. He spent 5 and half years in Insein and Tharawaddy prisons before being released in April 1996 and as the warden was signing his release papers he was asked what his plans were for the future. Thet Mhu simply replied “I will keep fighting. I will be back here”. He returned to his political activities immediately and played a role in the student demonstrations that happened just 8 months later in December 1996. Along with his colleague Thar Nyunt Oo (photographed in May 2010) he evaded arrest and hid in the offices of several organisations that had signed ceasefire agreements with the regime. In a bizarre twist of fate the authorities found themselves in an awkward situation knowing that wanted student activists were hiding out in buildings that they could not raid for fear of upsetting the tense ceasefire agreements. He finally fled Rangoon in 1997 and made for Mae Sot on the Thai-Burma border where in 2000 he helped found the AAPP along with Bo Kyi and other former political prisoners. In 2002 he decided to try to resettle to USA as he wanted to support his then girlfriend who was studying in the UK, however he was rejected due to his association to the ABSDF which was registered as an ‘outlawed terrorist organisation’. He eventually made it to America some years later and the ‘land of the free and the home of the brave’ had welcomed someone who was just that but he spent more one and a half years with no status or permit and life was incredibly tough. He eventually gained status as a political refugee and continues the flight.